Yesterday marked a favorite yearly event – the Museum Mile Festival. Every year, 5th Ave shuts down to cars in the evening and the museums open their doors for free. It’s always a nice opportunity to get to the museums (which I, like many New Yorkers, don’t often do). Plus, it’s just fun to walk down the middle of a street usually filled with traffic. Last night, the weather was perfect for the occasion. I met up with some friends at the Museum of the City of New York – my first visit there. With a grand entrance and historic appearance, the building is beautiful. We checked out the Maritime exhibit (which showed a historic look at downtown ports), New York Interiors (lavish displays of historic interiors), and a theater exhibit (with costumes from major musicals, including Rent). Definitely worth a visit. As usual, there wasn’t much time for more than one museum. We headed down to the Cooper-Hewitt Museum courtyard, always a nice spot, and watched a cool glass-blowing demonstration. After that, there was only a little more time to walk along 5th and admire the chalk artwork covering the street. I’m looking forward to the upcoming free events in the city – movies and concerts in the park. There will be free live music this weekend at the annual Madison Square Park barbecue event. The machine was designed by 2 M.I.T guys told me the host of the space. Go to Houston and Orchard to experience this music-making machine. What happens is that you input a few keystrokes via a laptop into the machine’s glands. And for the next few minutes, it churns out a song using ping pong projectile balls hitting xylophonic keys, wine glasses being spinned and a few different percussion instruments along the bottom half. The space is unique and very fun to try out. And after all is completed, you get e-mailed your videos. I am in NYC for most of the week and hope to post on some shows I saw including my show which just closed at D’Amelio Terras Gallery. James Kalm has a you tube video which highlights the increasingly thankless and frustrating task of trying to document shows in spite of the proliferation of no-photography policies at many galleries and museums. It’s a very strange, situation since most artists I know want people to see their work and also since the vast majority of online art press is very positive. After the Sports Museum of America scored its former location on Broadway, the Museum of American Finance has reopened on 48 Wall Street. They’ve taken the word “history” out of their title (I’m guessing to make it sound a little more interesting) and moved to a larger space that includes exhibits, galleries, and a theater. The Museum is now open Tuesday – Saturday, 10 am – 4 pm. Admission is $8 for adults; $5 for students/seniors; kids 6 and under free. Posted in Museums | Comments Off on Finance is History! This Sunday afternoon my fiance and I went to the Natural History Museum. This is one of my favorite things about New York City. This museum is so large and full of things to do. Children everywhere have little idea bulbs permanently flashing above their little heads. 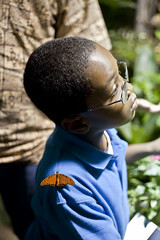 This time we visited the Butterfly exhibit which they have every year during the cold seasons. Next we visited the new Water exhibit. Definitely worth checking out. The knowledge flowing from the Natural History Museum is brain titillating. One thing I hope to do on this trip into New York is see the exhibit about Jane Jacobs at the Municipal Art Society and even better go on a related walking tour. Since Jane was an advocate and keen observer of the actual spontaneous order of city life, who didn’t leave us any 12 lane expressways or public monuments, she may be a hard subject for an exhibit. Mondays, Tuesdays, Fridays and Saturdays – 10:00 a.m. to 6:00 p.m.
Wednesdays – 10:00 a.m. to 8:00 p.m.
Sundays – 11:00 a.m. to 5:00 p.m. The National Park Service is reopening the Ferry Building on Ellis Island today. This is slightly ahead of the 100th anniversary of the peak processing day for the island; on April 17, 1907, 11,747 immigrants passed through and the Island was en route to a huge year, seeing 1.1 million immigrants enter. Much of the island’s buildings are still in disrepair but plans are underway to renovate, among other things, the hospital buildings, creating an educational institute and conference center.